House the ES-40 in a Eurorack case of your choosing. The power connector is Doepfer standard. 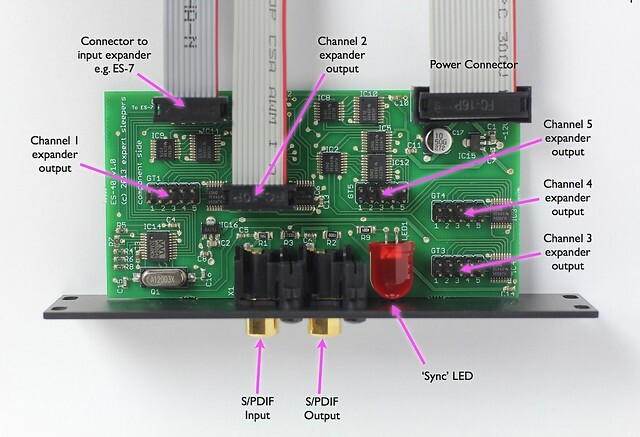 If using the power cable supplied with the ES-40, the connector is keyed and will only insert into the ES-40 the correct way round, in which case the red edge of the cable is nearest the edge of the PCB, and carries -12V. ("-12V" is marked on the PCB itself next to this end of the connector.) Be sure to connect the other end of the power cable correctly, again so -12V corresponds to the red stripe on the cable. The input connector is connected to the coaxial S/PDIF output of your audio interface, using a standard 75ohm phono cable. The large LED below the S/PDIF connections on the panel lights if the ES-40 recognises a valid signal on its input. See this page for discussion on connecting to optical S/PDIF (including the MacBook Pro's built-in output). The S/PDIF output connector is only used by certain expansion options e.g. the ES-7 CV Input Expander. The ES-40 has 5 connectors for ESX series expansion modules. Please turn the power off before connecting or disconnecting the expansion modules. Refer to the user manual for each expander for connection details. In general though, connection is via the supplied 10-way ribbon cable. The orientation is the same on the ES-40 and the expander (by convention, with the red stripe at the bottom).